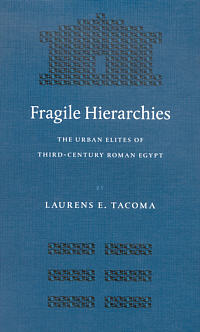 Tacoma's "Fragile Hierarchies" presents a "study of the position of the urban elites of the metropoleis of third-century Egypt" (10). The four chapters of Part One ("Hierarchies") define that elite. Chapter One begins with "number games" (22) played with Egypt's urban population in this period, concluding that "it would be difficult to argue that levels of urbanisation were substantially below 20%" (35). Chapter Two gives a model of Roman Egypt's urban system, in part through a rank-size approach to the nome or district capitals. Chapter Three focuses on wealth inequality, which appears high as measured by the Gini coefficient. In Hermopolis, "there was a large group of owners of small landholdings" (98) too small to support a family. In Chapter Four, Tacoma claims that at the opposite extreme, the high number of large landholders needed to maintain city councils made the councils themselves inherently fragile. The four chapters of Part Two ("Mobility and Continuity") explore this fragility in depth. In Chapter One, Tacoma argues that demography was the primary factor: "Social boundaries were permeable because urban elites did not succeed in reproducing themselves in sufficient numbers" (158). Chapter Two explores whether elite demographic patterns differed from patterns apparent in non-elite census data and matching life tables. His conclusions for longevity (178), marriage (185) and fertility (202) are all negative. Chapter Three focuses on property transmission, particularly the role of radical partible inheritance, in which fragmentation proceeded at an "astonishing" pace (212). 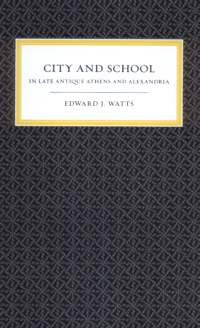 Chapter Four analyzes the city councilmen from third-century Oxyrhynchos compiled in the appendix. In his data, only 2.7% of all councillors are "known to have had sons who followed in their footsteps" (234). With this void in mind, Tacoma discusses a sub-elite, whose landholdings ranged from 50 to 100 arouras: "The line separating them from the elite was thin" (260) and they presumably strove for elite status to fill vacancies caused by demographic fragility. Throughout Part One, Tacoma summarizes and combines older models and analyses. Tacoma's is the second dissertation-turned-book published this year to apply urban system theory to Greco-Roman Egypt. Katja Mueller's work on Ptolemaic city size poses an interesting contrast to Tacoma's. (Mueller's relevant earlier articles are regrettably absent from Tacoma's bibliography.) Based on population estimates for Hermopolis and Oxyrhynchos, Tacoma uses rank-size distribution to project populations for 16 nome capitals (Table 1.2.1). Mueller uses the same rank-size approach, but based on census data for Krokodilon Polis (Arsinoe) in the third century BC. Comparing their population estimates is instructive. Tacoma's maximum figure for Roman Memphis is less than half Mueller's maximum figure for Ptolemaic Memphis. Where Tacoma projects 17,500 to 27,500 for Roman Ptolemais Hermiou, Mueller projected 8333 to 25,000 for the Ptolemaic period. Where Tacoma projects a population for Roman Arsinoe of 44,000 or less, Mueller's Ptolemaic census data produces only 3436 for the Ptolemaic period. Would Tacoma defend a ten-fold increase in the population of Arsinoe over several centuries? As Tacoma points out elsewhere, higher figures such as those in his model "imply an Egypt that was more Roman, and a Roman Empire whose impact was more directly felt" (35), an interesting implication outside of the realm of his book. But if nome size is the variable, we need to explain any divergences in these models. Tacoma's argument (50) that metropolis size correlates to nome size assumes that the latter dictates the former, largely through food supply. He is too quick to dismiss objections here. Metropoleis can get food from outside of their nomes. Tacoma's argument may have the causal arrows reversed. We cannot say that Ombos had a small population simply because the area of the Ombite nome was small when the need for an Ombite nome may well imply that Ombos was too large to fit into a neighboring nome. His treatment of factors governing change in population size (59) notes the potential role of e.g. ecological variations and military settlements as catalysts for local growth. But as with any model-based argument, they can be dismissed as exceptions (65) that do not harm the model as a whole. Tacoma is original and thought-provoking in the book's second half, particularly in his combination of prosopography with demographic modeling. But readers must be careful. Tacoma misleads by saying that his one-child scenario creates as much fragmentation as his two- and three-child scenarios (213). True, the same number of plots results in all three scenarios, but it hardly matters: one man with four plots is still better off than four men with four plots. Indeed, he calls the same process "consolidation" elsewhere in the book (260). Similar care is needed with Tacoma's intriguing discussion of testacy and property transmission. Tacoma asserts, admittedly without proof, an elite "preference for testate succession" (223), and argues that freedom to deviate from radical partible inheritance was limited even through testacy (228). He dismisses as "impossible" any attempt to calculate intestacy and as "futile" any attempt to explain the phenomenon. But an easy answer is in reach. Both intestacy and a lack of marked testate favors to first sons show that either (a) Tacoma is wrong about the fragility of elite hierarchies, or (b) he was right, and no one was bothered by it. Tacoma's description of a "sub-elite" ready to move up in the pecking order is correct. But if he is right that the elite had no distinguishing demographic characteristics, then the sub-elite would have faced the same demographic challenges as the elite hierarchies. Tacoma describes the two most likely ways these sub-elite rose into the ranks of the elite: consolidation of property through a single male heir and purchases through "a lively market in land" (260). But both avenues would be open to the elite as well. The "most important" strategy Tacoma grants the elite in defense of their status (262) is the choice of an "appropriate spouse." Yet, in an earlier - and uncharacteristically confusing - passage (215) Tacoma claims that "marriage forms no remedy" to radical partible inheritance: "An impoverished groom cannot make up for the deficit in status by marrying a rich bride." Throughout his work, Tacoma submits too easily to the tyranny of demography. The census data from Greco-Roman Egypt has produced an academic cottage industry. This deserved attention diverts us from other vital issues. Elites do circulate and hierarchies are fragile, but not solely because demography dictates failure to self-replace. When liturgical burdens led elites to renounce their property through the cessio bonorum, we may ask whether a failure of will was at work as well. When Tacoma claims that "urban culture was [...] rather fragile" (10) he conflates urban culture with elite demography. Tacoma notes the importance of ideology (264), but the point is worth stressing. When the elites and the sub-elites are in ideological agreement about the rules of the game, urban culture is quite stable. The demographic fragility of Tacoma's model was not as momentous as he makes it seem. Katja Mueller: Settlements of the Ptolemies. City foundations and new settlements in the Hellenistic world (= Studia Hellenistica, 43), Leuven 2006.